BRAZIL: FROM EMERGING MARKET TO ECONOMIC POWERHOUSE? President Obama with Brazilian president Dilma Rousseff in March. The United States should have been worried in April 2009, when China’s Ministry of Development, Industry and Trade announced that China’s $3.2 billion investment in Brazil surpassed the United States’ $2.8 billion. This transition in Brazil’s foreign investment would foreshadow Brazil’s continuing growth with China, whose relations with Brazil are now strongly threatening the United States’ position as the global economic leader today. The Brazilian government is pushing to become a more prominent global player. Rather than maintaining the country’s commodity trading, Brazil’s President Dilma Rousseff is focused on developing infrastructure for new types of investment and bringing more “smart jobs” to her country. Upon Rousseff’s visit to China in April 2011, she secured concrete contracts for China to buy more products from Brazil, surpassing the typical raw materials such as iron, ore, and oil, which means China will be investing more than its previous $17 billion in Brazil in 2010. Rousseff utilized her visit to highlight the world’s attention towards Brazil’s infrastructure of distribution networks, airports, and most importantly their developing green sector. Brazil’s rush to increase its GDP is backed by China, and although President Obama visited Brazil in March, he failed to acknowledge the numerous investment opportunities for America in Brazil. The United States is falling behind in the international race to maintain financial power. The World Bank predicts emerging-market countries are outpacing developed countries at an extremely fast rate of about 4.7% a year until 2025. “By 2025, six major emerging economies — Brazil, China, India, Indonesia, South Korea and Russia — will account for more than half of all global growth, and the international monetary system will likely no longer be dominated by a single currency,” according to a recent study by the World Bank. I can assure you, the approaching 2014 World Cup and 2016 Olympics in Brazil are signs of Brazil’s impending success; moreover, President Rousseff has already requested China’s expertise and services in preparing for the upcoming Olympics. When she visited China, representatives from over 300 Brazilian and Chinese companies interacted at a business seminar, and were recruited for support in the area of infrastructural logistics and technology, while America’s presence was completely absent. Brazil’s government is cognizant of its opportunities to rise to power. I believe that the United States is not worried enough, and we have not paid attention to Brazil thus far as its economy matures — but it’s not too late to take notice. The Brazilian Society of Transnational Corporations and Economic Globalization (SOBEET) predicts a total of $65 billion dollars for Foreign Direct Investment (FDI) by the end of this year. The UN Economic Commission for Latin America and the Caribbean (ELAC) reported a total of $48.5 billion so far in 2011. Will America recognize Brazil in time to ride the bandwagon? It seems that companies such as GM have taken notice: the auto manufacturer just announced its increase in production to 280,000 vehicles by 2012. These announcements were released alongside Fiat and Mitsubishi’s similar investment press releases, and China’s announcement to build an automobile manufacturing facility for Greely within Brazil this year as well. However, this limited American investment is not enough. Imagine if the downfall of Dominique Strauss-Kahn from the International Monetary Fund and the recent push for a “non-European IMF leader” collide and open up a spot for a Brazilian leader to take the position. Brazil will no longer be an underrated country in the global market. These are very real concerns. America needs to take notice that Brazilian is a fast-moving train on its way to taking over the global monetary market, and we need to improve our relations with Brazil before it is too late. Photo courtesy of Fotos Gov/Ba. 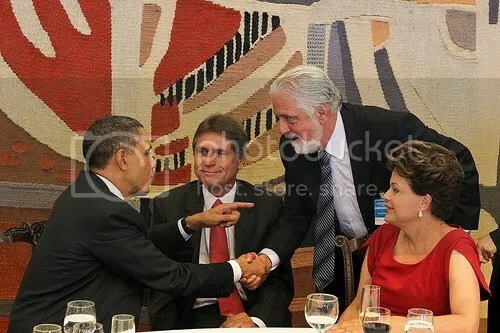 The American diplomacy has treated Brazil as a “banana republic” for a long time, until now, despite it is the 6th largest economy and 4th largest creditor of USA… Meanwhile, the relations with China are growing extremely fast, because these economies are complementaries. The future will reveal that USA lost its opportunity to become an important country in the Americas. In 2020, China and India will be the largest partners of Latin America, and USA will be isolated of the rest of the continent, in a probable crisis with Mexico.